The Society of Editors have condemned a decision by Liverpool councillors to support a ban on retailers selling The Sun in the city, calling it a slide towards censorship . At a meeting of the full council at Liverpool town hall, councillors backed a motion calling on retailers to stop selling the paper. It came after the council heard from Ralph Hadley who called on council members to throw their weight behind his Total Eclipse of The Sun campaign . He said around 220 shops had also agreed to stop selling the paper. According to the Echo, Liverpool Mayor Joe Anderson said he supported Total Eclipse of The Sun 110% and added the newspaper will never, ever, be forgiven . I think the issue is beginning to stretch towards censorship. No public organisation should be seeking to restrict a perfectly legitimate newspaper. Strong feelings towards The Sun stem from its coverage following the Hillsborough stadium disaster on 15 April, 1989. The Sun angered Liverpool supporters when it claimed in a front page story after the disaster that fans of the club had behaved despicably. 23 years later following an independent report into the disaster, the paper apologised for getting it wrong with the headline The Real Truth . Derry City and Strabane District Council has passed a motion asking local newsagents to stop selling The Sun. The motion was put forward to show solidarity with the families of the Hillsborough football stadium disaster. It also called on the council to support the campaign group Total Eclipse of the Sun , which wants all shops to boycott the newspaper. We are astonished that in Derry - a city that has prided itself on its association with civil liberties and free speech - some elected politicians think it's appropriate to push such extreme censorship on its citizens and retailers. The vote was proposed by independent councillor Paul Gallagher and supported by 27 SDLP, Sinn Féin and independent members. One unionist representative voted against, whilst seven more unionists abstained. Liverpool councillors had previously backed a similar censorship motion a few weeks ago..
Wirral Council is expected to back a campaign encouraging retailers across the borough to stop selling The Sun newspaper. For this reason we ask all retailers and vendors of newspapers to stop selling the Sun. 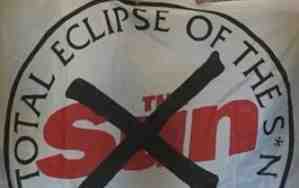 We applaud the group called 'The Total Eclipse of the S*n' for their endeavours to rid our city region of this newspaper. Liverpool councillors unanimously backed a similar motion to stop selling The Sun in September. Derry and Strabane District Council also recently agreed a motion also asking local newsagents to stop selling the title. Councillors are set to vote on a proposal to ban the The Sun newspaper and its journalists from Flintshire County Council offices. The motion has been put forward by Deputy Leader Cllr Bernie Attridge and Cllr Kevin Hughes. It also seeks to ban Sun journalists from reporting on council meetings. The motion is said to reflect continued strong feelings about the Sun's reporting of the Hillsborough tragedy. This is a childish and typically spiteful move from a Labour Party which no longer cares for the fundamental principle of free speech, and which no longer backs a free press. Whilst we might not like certain newspapers -- and might question the impartiality of other platforms -- we have a right not to consume their output. But we shouldn't have a right to ban them. This is how dictatorships start, and Jeremy Corbyn should know a thing or two about them. The legality of the motion is being considered ahead of a scheduled council discussion on September 27. Flintshire council has voted to support newspaper sellers who refuse to sell The Sun. The motion was carried by 36 councillors to six, with 18 abstentions, at a meeting on Wednesday. The motion, put forward by councillors Bernie Attridge and Kevin Hughes, asked the council to support the Total Eclipse of the Sun boycott campaign in solidarity with councils in England. The initial motion had tried to ban The Sun from council buildings and stop any of the newspaper's journalists attending council meetings, but these aspects have since been removed.